Our reputation for having the best web hosting wasn’t earned just by investing in state-of-the-art hardware. We earn it through what we do with that hardware. We have an innovative technology platform that continues to develop and improve, thanks to our talented hosting team. All our web hosting services use 20i’s proprietary autoscaling technology, created by our team of experts. No other company has access to this. Autoscaling literally means that our resources scale automatically. Bandwidth, memory and processing power is scaled up or down instantly – depending on demand. This is what makes them ‘true elastic cloud’. If there’s a surge in traffic, your website will continue to offer the same fast experience for every user. This is because a site isn’t hosted on one or two servers. Instead, it can access the whole platform’s resources: multiple servers. And we always keep dedicated resources in reserve to cope with traffic. Also, it means that if there’s a spike in demand and your shared hosting ‘neighbours’ become busy, it doesn’t affect your site speed. Busy sites are isolated from others on their own servers. This doesn’t happen at most other hosting providers, and even if a hosting company says they do something similar, no one does it better! Load balancing is about sharing traffic across servers. Other web hosts may say they use load balancing – and indeed they do – but not the kind we’ve developed. Their load balancing mitigates failover: if a server goes down, your site will be moved to another, so it stays online. It’s a kind of disaster recovery. That’s expected: we offer that kind of server redundancy as well, even though we use some of the best hardware in the industry – thanks to our long-term partners at Dell – and a robust 10 Gb network. But 20i load balancing is of a different calibre. Our load balancing makes use of monitors that will respond to traffic load and balance it across multiple servers when needed. Many other providers don’t offer this. The consequence for you is this: with 20i, your site stays online, and remains fast, whatever load the servers are under. All three of our premium UK web hosting platforms include our autoscaling and load balancing technologies. Your choice is between what operating system or content management system you want to use: Linux, Windows or WordPress. If you want to use all three, you’ll need our Reseller Hosting plan. Our Linux platform is great for most types of websites. It's the most versatile choice. Built for speed and security by our in-house experts, we’ve fine-tuned Apache for even better performance. It also offers over 70 one-click installs of popular open source apps, including Drupal, Joomla! & Magento. Managed WordPress hosting, built by WordPress enthusiasts. Performance tuning makes sites load up to 48 times faster. Features include: WordPress staging, automatic updates, plugin/theme monitoring, brute force login protection, timeline backups, code optimisation and our own exclusive StackCache speed plugin. Our robust Windows web hosting platform is backed by a speed-boosting IIS cluster. This cluster provides redundancy: there’s no single point of failure. Our Windows platform is optimised to be fast and secure. It's the perfect choice for sites that use ASP, ASP.NET, MS Access, or MS SQL. We don’t cut corners to get the advertised price down. Our Linux, Windows, and WordPress platforms include these extra features as standard. Many hosting companies don’t invest in SSD storage, or if they do, they use the cheapest available hardware. It’s so they can keep ‘sticker-prices’ as low as possible. 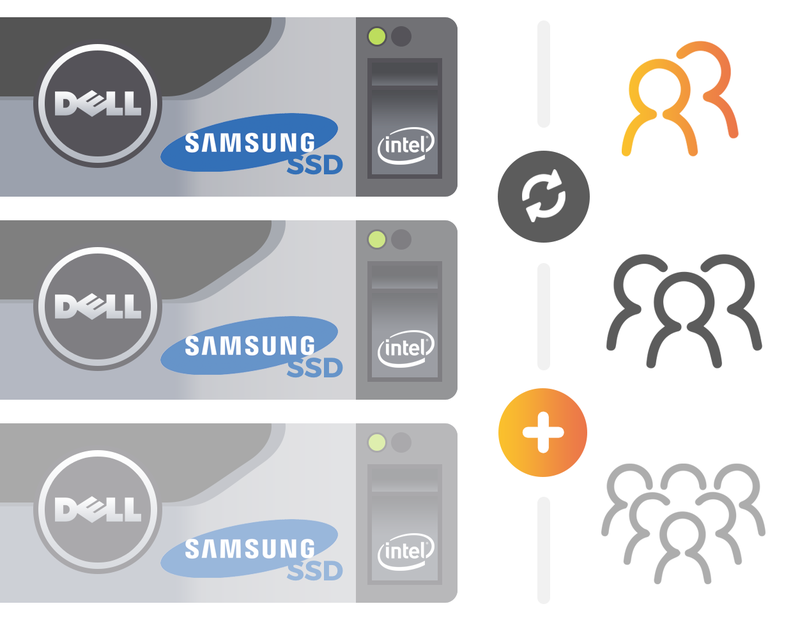 That’s not the case with us: we use Samsung Enterprise SSDs in our storage arrays. Each Dell web server has two 2.4 GHz Intel Xeon E5 v4 (Broadwell) octa-core processors with hyper-threading. This gives 40 logical cores per machine. These have access to plenty of fast memory resource: 64 GB 2400 MHz DDR4 RAM. Any of our web servers can serve any website we host at any time. We bake-in security to every layer of our web hosting. Our storage is resilient to the level that – in a worst-case scenario – whole storage servers and disks can fail with no downtime. We take daily backups off-site for extra protection. But that’s not all – read more about our secure hosting. All websites and VPS are hosted in secure, state-of-the-art data centres based in the Midlands, UK. They’re manned 24/7 and include high-level physical security measures. These cover everything from backup power generators to advanced fire protection. Our platform is built for the future of the web. We support IPv6, which is the new standard for IP addresses. Our servers use HTTP/2 – a major revision the HTTP network protocol – as standard. HTTP/2 means that browsers can request and receive more data than before. It results in faster loading websites and happier users. All our technical support staff are based at our Nottinghamshire, UK HQ. They have ample industry experience, having worked with our directors for many years. If you have a really thorny issue, they have direct access to our developers in the same building. They can be contacted through instant live chat and our email ticketing system. The Domain Name System (DNS) translates domain names – and email addresses – into IP addresses. So when you visit a URL, your browser knows the address of the server to download the page from. It’s an essential part of the internet – so it needs to be fast. Google knows all about fast internet response times – as you’d expect! Their global fibre network leads the industry. It provides a quick and stable response regardless of traffic. So we built our DNS platform on the same infrastructure as Google. 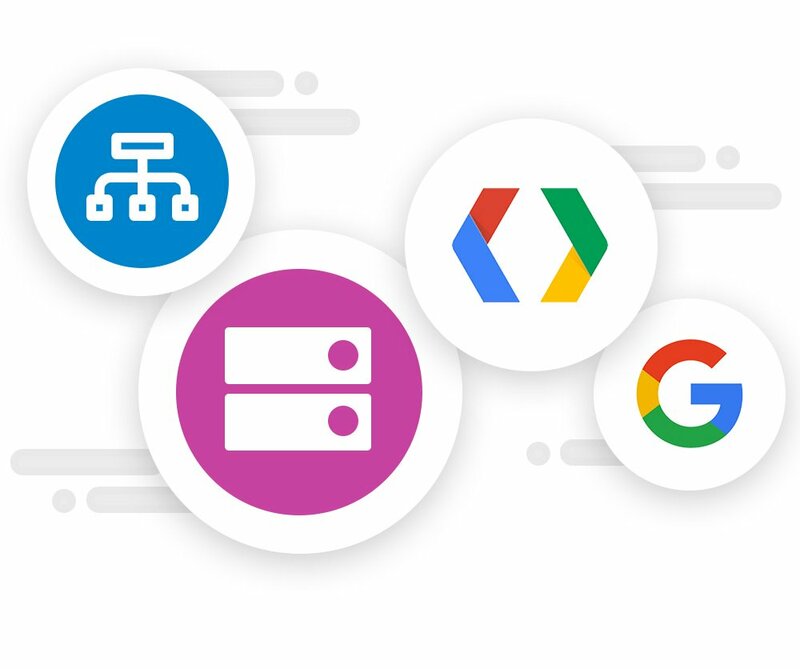 All domains hosted with us benefit from Google DNS. 20i Resellers can take advantage of our white-label Virtual Name Servers and offer this rock solid, cutting edge DNS solution under their own brand.